The innovative AR series knives offer a unique combination of function, artistry and ergonomics. The 440 stainless steel blade is supported by high strength die cast aluminum handles finished with an electro less nickel coating and over molded with SoftGrip™ rubber inserts. 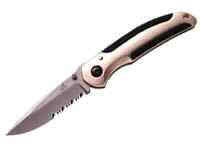 The result is a knife that is tough, lightweight and contoured to fit comfortably in the user’s hand. The blade rides on two Teflon™ washers to ensure a lifetime of smooth one-handed opening.